Last week, a seller notified me eBay had opted him into the Global Shipping Program "right out of the blue." He said he opted out, but was told it takes 72 hours. Here is his response to eBay on why he wished to opt out: "I have no interest in selling to non US buyers. But if I were interested I would want to make the money for shipping myself. If a buyer is willing to pay as much as you charge for that I would want to keep the money. I am not in business to make ebay or Pitney Bowes really rich." We've noticed you have a number of listings that are a great fit for the Global Shipping Program but are not currently enabled for international sales. This means you're missing out on millions of potential buyers. To help make it easier for buyers in up to 64 countries to purchase your items, later this month we will automatically enable all of your GSP-eligible listings. With the Global Shipping Program, you simply ship to a US shipping center where international shipping and customs clearance are handled for you. And since your buyer pays all fees up front, there are no additional amounts due upon delivery. No action is needed to take advantage of this global selling opportunity; simply leave your settings as they are now. Eligible items are identified automatically, free of charge. However if you would like your GSP-eligible items to be excluded from the Program simply click here by November 10, 2014. And as always, thanks for selling on eBay! One of the sellers who received the letter wrote, "Ah now isn't that awfully nice of them to automatically turn on GPS for me. I very much dislike their GPS program!! I had a pretty bad shipping experience with it, and turned it off of my personal account. Now they turn it on for my work account." In tomorrow's Newsflash, we'll delve into some of the reasons why sellers don't wish to participate in the Global Shipping Program. What do you think? 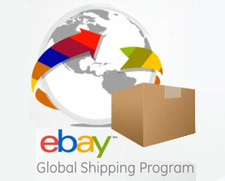 I joined Global shipping Program on the promise that my listings would be open to thousands of new customers world wide. Rarely a sale comes to me. The GSP is a complete busted frailure. My total ebay sales for October 2014 were 75% less than they were the previous. My customer service level is the highest it has ever been and my sales are the lowest ever. I will continue to demand that ebay give my listings visibility in ebay search engine. If I was still selling on eBay I would absolutely not want anything to do with the GSP. As the seller who was quoted in the article states: "I am not in business to make ebay or Pitney Bowes really rich." Which is all the GSP is designed to do. I have read too many bad things about the GSP, including collecting tariffs where none are due. Why would any buyer agree to pay double or triple what a seller himself could ship an item for? I know some sellers like how easy it is to use, but I've heard about too many sales being cancelled once the buyers actually see what they have to pay. I thought eBay didn't want sellers to charge excessive amounts for shipping, yet eBay itself seems satisfied doing just that. "I thought eBay didn't want sellers to charge excessive amounts for shipping, yet eBay itself seems satisfied doing just that." In the way friendlier selling environment of the past, I have shipped items overseas by request. No more. No global. No touchy my settings, please. Hands off. Thank you for the heads-up! I had opted out of the GSP shortly after its debut and had NOT gotten an email from eBay that I had been opted back in, but I just checked my settings and there it was. I'm furious as I had a NPB a week or so ago who was waiting for me to invoice internationally (which I wasn't about to do). I finally canceled the transaction and after spending a ridiculous amount of time with customer service they removed the cancellation defect but played dumb as to how the buyer had been able to make the purchase to begin with. Finally made sense today. Jerks. I'm happy to sell my wares internationally - using my shipping terms. It takes me no more effort to create a shipping label & pay for USPS postage, fill out the proper customs forms & cart it off to my local PO (taking the round-trip mileage as a business expense naturally), than to prepare other items for domestic shipping. The only difference is I have to get the shipping weight spot on, or at least not lower & use the proper shipping method. Again, no more work than domestic. As for foreign delivery, I've had only 1 non-delivery in Mexico & 1 in Malaysia (insured properly thank goodness). Had no problems with Italy for small parcels. I ship to Japan regularly with no problems as Hong Kong & China, South Africa, even once to Russia. That said, I think GSP is an unnecessary make-work and a profit centre. If you are going to sell internationally and you may be pleasantly surprised by the response, start slowly with Canada & the EU & get used to the water. It is borderline criminal that eBay will interfere in YOUR business. I would say about 25% of my sales are international. They always have been. In fact more in the past up to this year when a 4 oz package could go for 1/2 of what it costs now. It went from about $5 to $9.00 just this year. I had been shipping at those previous rates for years and years. But International is so easy. I just have to sign and date the Ebay generated shipping label and put the package in my mailbox for pick up that day. AND correct me if I am wrong, but Ebay does NOT take FVFs on the shipping portion of the international sale. That was a big concern of mine when they first started adding their commission to shipping. International customers for me have always been easier to deal with than some domestic. Except that right now my Etsy Canada customer has asked me to mark his package ''gift''. There is no way I can. In fact with the shipping generated by Ebay and Etsy there is no way. But I am sure he will understand. I do wonder why my Norway customer just asked if I wrote something on the label that has caused her to have to pay $30 duty on a $19 vintage wool jacket ($18 shipping). She said that under 30.00 there is no duty. I did not write anything on the label at all. Has anyone else encountered this? I would never gouge my international customers with the exorbitant rates Ebay charges with the GSP. It is unconscionable and gives international shipping in general a bad name. No one who got involved in that would ever do it again. Besides with international shipping so easy now why bother with it? Oh and with one click I insure packages under $100.00 world wide for .95 cents at Inkfrog with Shipassure. Its just a little more for higher priced items. I think it was 2.95 for a $300.00 doll to France. Much cheaper than the PO and easy to make a claim. Oh darn, it has the wrong power plug, and voltage is 110V not 220VAC, and the hertz cycles are 50 not 60, the directions are in English not Hungarian; definately SNAD! Jelentősen nem ahogy vhol leírt! Szóváltás ingyenes visszaküldési címkét felszámított eladó! Global shipping. They act as if its brain surgery compared to domestic shipping. The difference is one more label and 3 three signatures. I can handle it, thanks Ebay. Besides, if you send domestic items to a APO/military base/outside the 50 states etc. You have to complete more forms than an international shipment. They don't have a shipping program for that. I suggest their next piece of genius should be an out of state shipping program. Shabbychick. Just so you know, First class international mail went up 55% the same time OUR post office started to subsidize China Post. Basically, WE are helping to pay some of the costs when China ships their small packets here. I refuse to use GSP and I sell to some international locations. This program is ripping buyers off by charging them import fees on items that shouldnt be charged a fee! If the country does not collect the import fees for the item, Ebay and Pitney keep the money and the buyer is out the money. I cant believe this is legal. THIS is where the FTC needs to be looking. I opted out of eBay Global Shipping several weeks ago and have yet to see eBay try to opt me back in. My primary reason for opting out was the lack of any means of contacting eBay Global Shipping about issues, long delays in forwarding items from Erlanger KY to the overseas destinations (one small item to the UK didn't leave KY for 2 weeks), no way for the Buyer to contact eBay or eBay Global Shipping to make a claim for damaged items, lack of confirmation of delivery, and repeated lies regarding program details. ted he was importing orchids, and ebay GSP is exporting your items, but the risk is there if the customs form has a mistake, and this 67 year old retiree went to Federal Prison! Who trusts ebay enough to fill out your customs forms correctly? Not me.
" AND correct me if I am wrong, but Ebay does NOT take FVFs on the shipping portion of the international sale." You are mostly correct. What they do is base the shipping FVF on whatever amount you stated on your listing for US shipping. So if you ship to a US address for $5, then the FVF for the international shipment would be based off the $5. If you offered free US shipping, then there would be no FVF on the international shipment. Oh please sign me up to your new shady service so I can continue to be abused, exploited, and blackmailed. I swear this Global Shipping Program was thought up by a Nigerian scam artist. Me too. Nearly 2 months ago I was among the first Victims of this extremely RUDE approach eBay has been using to amp up GSP usage by stealthily FORCING eBay sellers into this Solution in search of a Problem Global Shipping Program. I only discovered that 100 of my 1,100 listings had been Kidnapped into this GawdAwful program by accident. I had used Bing to look and see if any of my own listings Were showing up in their search. That showed me one in the ebay.uk site. When I opened the file I was Stunned to see that in the U.K. site my $8 five oz. DVD was being shown with $41 as the Cheapest$$ shipping option. I have been selling internationally for roughly 300 sales over the past 5 years with no grand problems. International 1st class to U.K. for this self-same 5 oz. DVD is only $13. I called Customer Service and although I Never heard any word Back from CS within 3 days the number of listings that Had Been getting Jammed into GSP stopped. No, I never Opted In so this was not some Glitch. Maybe someone else can clue me in, but if one had not ELECTED to join the program there was no opportunity to Opt Out. Under Preferences the only check box was to Opt IN. No, export buyer was Stupid enough to pay that $41 ($28 to Canada) price to buy any of my DVDs that had been Co-Opted during those 2 weeks that eBay an their own kick decided to effectively STOP all my export sales on those 100 listings by making them Too expensive. Similar Light Weight items being sold on eBay will be in the SAME unsaleable situation as the GSP is predicated on all export sales being by International Priority Mail.. worse yet priced as though each one Had to be in a customer's box and in that class the cheapest is as One Pound with stair-stepped rate price such that 17 oz would rate as 2 pounds even though under Int 1st Class it is Ounce by ounce right out to 64 ounces. Last week, eBay sneakily went into my settings and opted me in for their global shipping. Of course, I had opted out when the program first activated. So, I opted out again, even though their pop-up note indicated it would take 'several days' to reset and still be available to current auction items. Grrrrrrrrrr. For me, especially with all of eBay's fuss about customer satisfaction, the issue is control. I listed the item, I sell the item and I'll ship the item, ensuring my rigorous standards are not diluted by some kid at the shipping hub who may recklessly toss my item around during forwarding. The biggest problem with this and all of eBay's other nonsense, in my humble (and 15 year selling on eBay) opinion is that the people who create and implement these asinine policies have never sold a gottdam thing online, let alone eBay. And I'm quite sure that if I was clocking them big wall street paydays, I wouldn't be selling online either! Marie, Do you have any copy of eBay's announcement that they were going to start showing NON-exporting USA eBay seller's listings to Ten Select Countries who routinely use English? It should have been within the past 2 months. I know I did not Dream it up, but I've been unable to located it in my eMail, eBay messages or eBay announcements. I think this whole effort by eBay to Urge Cajole Tug and now Kidnap sellers into GSP is extremely counterproductive. I see it as a sure sign that some SUIT at eBay is desperately thrashing around trying to put smear Lipstick on this foundering Pig of a program. Kidnapping sellers who already sell internationally is DUMB enough, but I keep picturing how this will go over for some Other USA eBay seller who isn't even willing to ship to other than the Lower 48 states. I mean really.. someone unwilling to ship to Hawaii or Alaska yet Saddled with an enforceable Contract to ship GSP to Saudi Arabia? (Yes, Saudi Arabia is one of the ten English speaking countries on that announcement.) Three different times in my own eBay purchases I've found Christian and Mormon proseletizing flyers jammed in with the product. How would That go over in the country that is home to Mecca and responsible for defense of Islam? No, I would have no faith that the Erlanger repacking crew would 100 percent find, recognize and remove such inflammatory items.